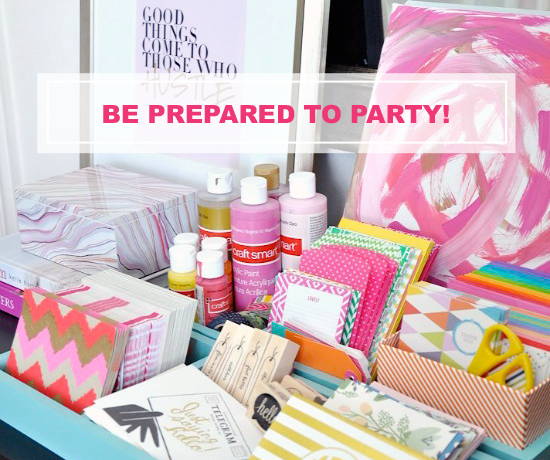 IHeart Organizing: UHeart Organizing: Be Prepared To Party! 47 UHeart Organizing: Be Prepared To Party! One of the reasons I heart to organize is because I can't stand spending time digging and searching for things, especially when I am in a rush to get out the door. 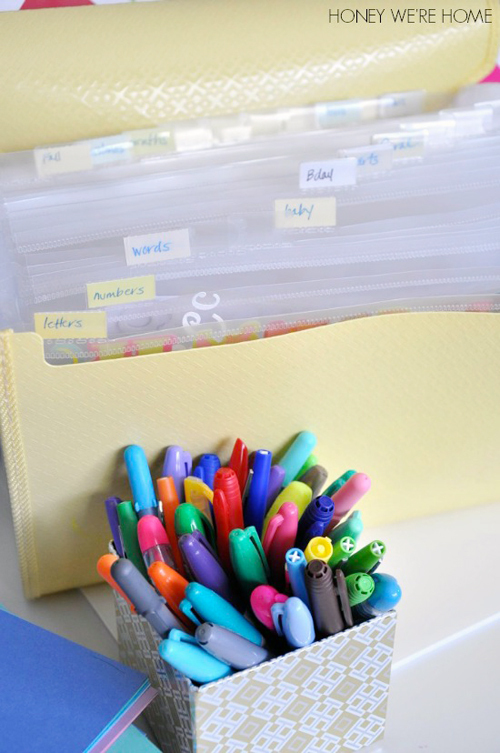 Another reason I organize is to be prepared when special occasions arise. I have been in situations where I am making last minute dashes through Target ten minutes before my kiddos have a party to be at, and it is stressful with a capitol S. Not to mention expensive. Megan of Honey We're Home is joining us today to chat about how she prepares for events, and is offering up some great tips to keep you on top of your party attending game. The month of August found us celebrating six little friends' birthdays with parties almost every weekend. When the invites started arriving (via mail or Evite), I started to feel a little overwhelmed. I wanted to make sure we had all the dates/times/places calendared, that none of the parties overlapped, that we RSVPd on time, and that we had gifts for everyone. I hadn't considered "preparing to attend a party" a process until we got all these invites at once. If you have more than one child, I'm sure keeping up with their social calendar of birthdays can be quite the juggling act at times- especially during the school year when you're also dealing with sports/dance/gymnastics or other activities. 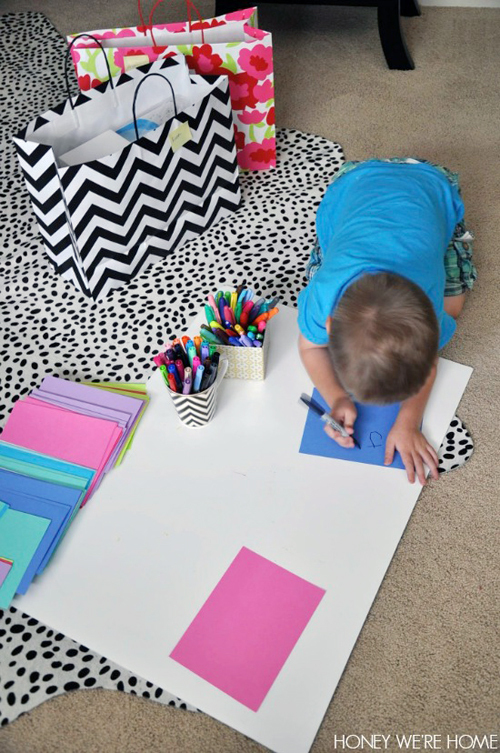 Today, I'm sharing with you some tips on how to stay on top of the birthday parties (or other events where gifts are appropriate) and some cute handmade cards to keep the costs down and make the gift more personal when it's for a child. If you have an Evite account (just sign up with your email and password), you'll be able to log in and see all at once the Evite events you've been invited to. As soon as we receive the invite, I confirm that we can attend, and RSVP right away so that I get it done and the host has enough notice that we'll be coming. At a lot of these kids' parties, if the party is at a venue, parents pay by the number of children attending, so it's polite to let the host know if you won't be able to make it. 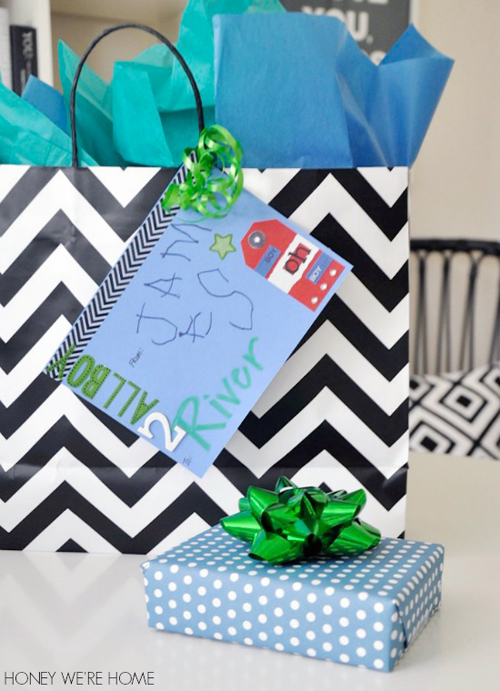 I have simplified kid gift buying by purchasing all birthday gifts online. It's more convenient than in-store shopping with a toddler and the selection is better. I find Amazon particularly usefully because you can search for gifts by gender, age, type of gift (arts/craft, animals/figures, puzzles, sports, etc.) and read reviews from other purchasers about whether the item is quality and a hit with the kids. The "best seller" items are usually good. If I give a gift that is particularly well-received, I've been known to purchase it in multiples and have it on hand for future gifts. Who knew 2 and 3 year olds would like a $10 Mickey Mouse play dough set so much?! For the adults in my life, I keep a Pinterest "gift idea" board and refer to it often. 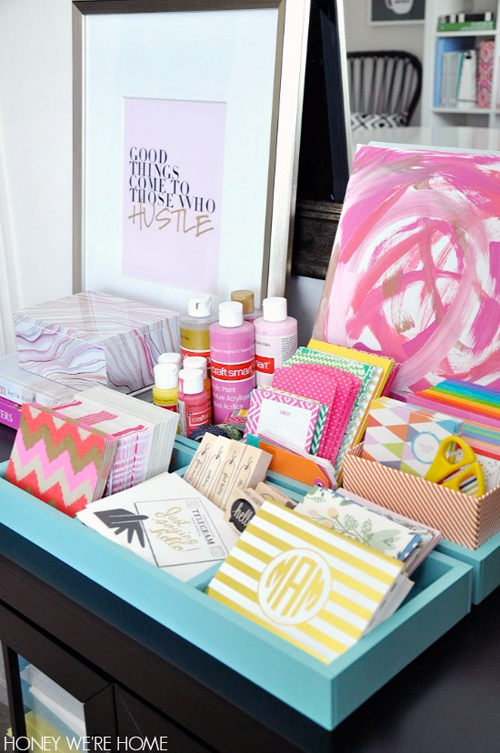 Or, even better, I'll search my friends' Pinterest boards to see if they have one for "stuff I want" - sneaky huh?! Shhh... Although Amazon is great for kid presents, for adults I like Mark & Graham (for monogrammed items), Minted/Paper Source (for personalized stationery), C. Wonder (for unique, cute items) HomeGoods & Hobby Lobby (for teacher gifts), and let's not forget the grocery store for wine! La Crema Chardonnay, Santa Margarita Pinot Grigio, and Liberty School Cabernet are three solid, inexpensive choices. When a gift arrives, I tag it with a small post-it note with the recipient's name on it and put it in our bar area until I'm ready to wrap. Then, I make sure I have the appropriate sized gift bag or proper wrapping paper. I've stopped buying birthday cards, opting instead to make our own as we sure have enough supplies for it! I love having craft supplies of all kinds on hand from markers, to washi tape to stampers and stickers, so it's fun to actually use them! 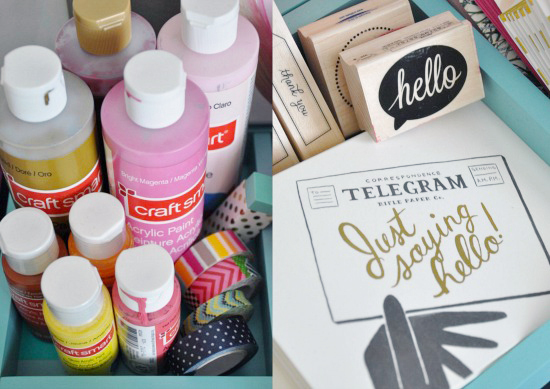 I have a wrapping cart for organizing wrapping supplies in my office closet, but I like to take the top two divided holders out and keep them in my office for easier access for making notes and sending cards. I've kept our stickers in a plastic file folder from Wal-Mart for years so I can find what we need quickly. 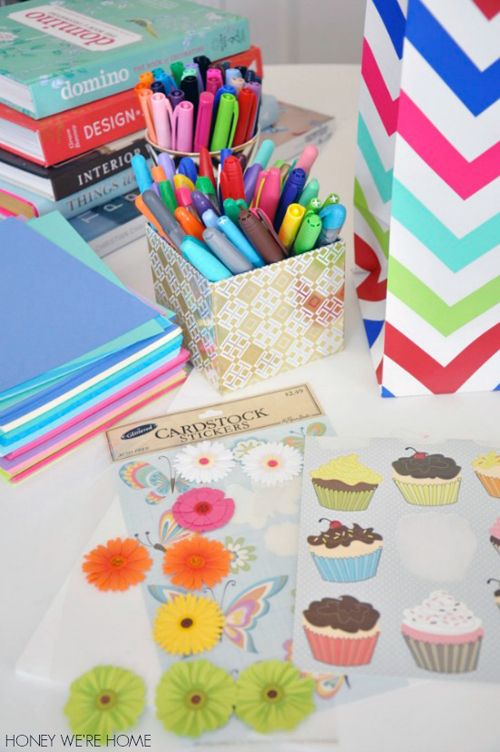 You can always find cute stickers on sale at craft stores like Michaels or Hobby Lobby. Markers are kept in an old candle box and cup. 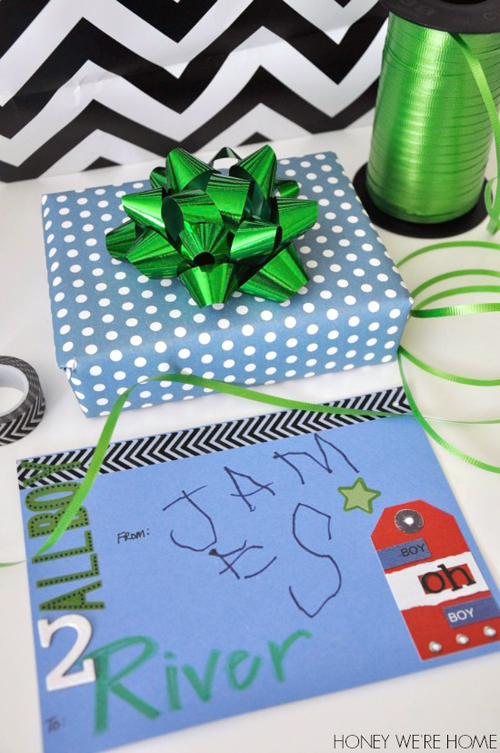 Getting my son in on the gift giving process helps instill in him the value of giving, and gives him some letter writing practice! 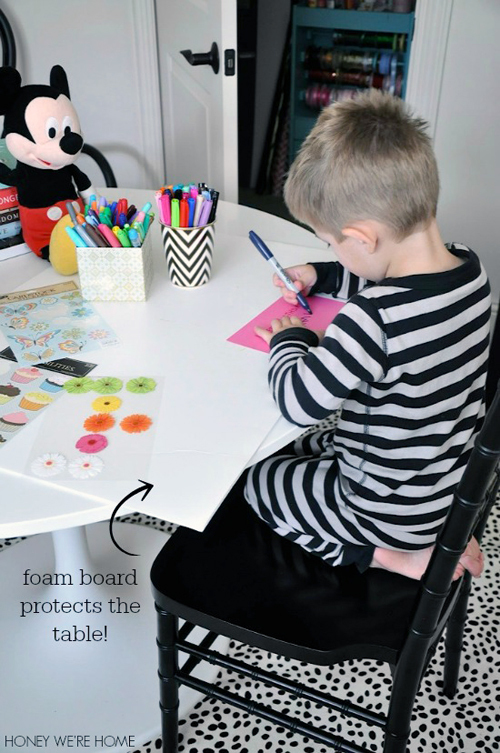 A foam board or vinyl tablecloth protects the table from scratches and stains when he's creating at the white table. Or sometimes, he likes to get on the floor. I found these cute "Handmade with Love" stickers at Michael's. 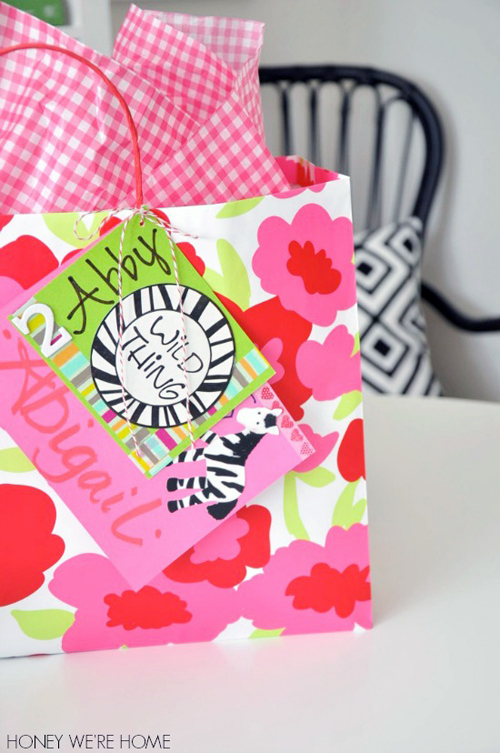 Do you have this birthday party thing down to a science or does it stress you out sometimes? I love this post. Yes, I agree that you need to RSVP. I hate it when parents don't RSVP and then I don't have enough or too much of something! Love your calendars! Thank you! They are from paper source. 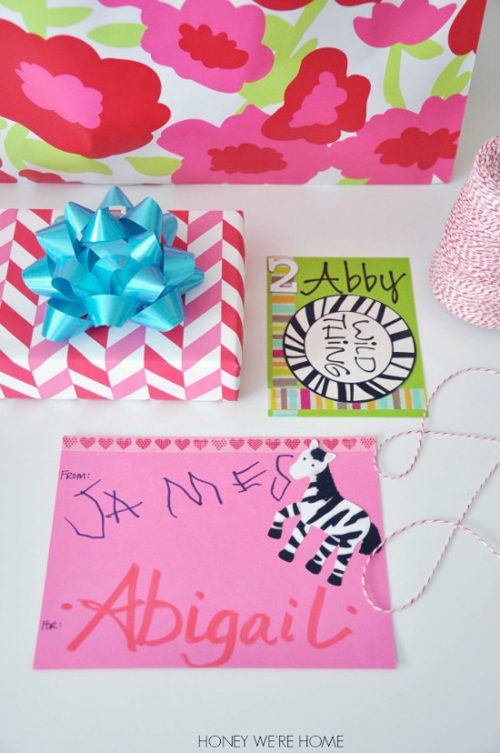 SO many good ideas in this post- I love the idea of making your own cards, and buying things in advance online, and marking with post its. I have a gift wrapping section in our attic, I love having pretty wrappings on hand, and lots of tissue paper!! Great ideas! I do a couple of them (buying presents in multiples, the kids make the cards etc.) but, with the new school year looming, I think a plan like this is gold. Thanks for the reminder! I'm glad you found the post helpful Catherine! I almost always give art supplies as gifts for kids. It is something that almost all kids enjoy and it doesn't matter if they have duplicates. I buy things when I see them on sale or clearance and keep a box in a closet. When we have a party to go to, my kids pick a few items from the box. Where did you get that lovely calender ? What a great idea! I love this and am going to work on organizing this. Thanks for the wonderful inspiration! I was distracted by all the pretty colors! No I am downright awful when it comes to parties or the like! My boy would love it, if I would get more on top of it...he is always the one trying to get me to make sure we don't forget someone's birthday...I often forget my own! LOL The card station looks like it should be in a very nice boutique! So many great tips here! I'd love to know where Megan purchased her fabulous kitchen calendar! Thanks for the reply, Megan! Here's hoping that I can find them locally - they're so colorful! 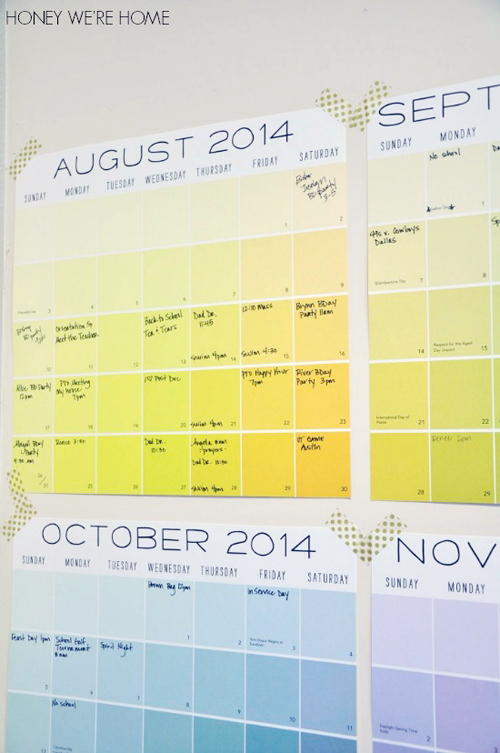 I HAVE to have that wall calendar! Where can I purchase? First, I love it when we get an invite that says "no gifts please". We do this for our 3 boys and it makes the party more about celebrating the event and less about "What did I get?" I think parents appreciate it too - all of those parties start to add up and when you are the one hosting and trying to keep the clutter out, you aren't bringing in toys/games your children may not be excited about, but can't return. Second, I love stocking up on art supplies during the back to school sales - markers, crayons, glue sticks - for $1 each! Fun and colorful, added to coloring books and construction paper packs. Third, I stock up on Target gift cards - kids love shopping for what they really want! Thanks for all of your wonderful posts - I've gotten so many great ideas from you!!! Thanks for sharing those ideas Evelina. Our son has so many toys, we should consider a "no gifts" party . . . .
Where is the pink art print from? Hi Lauren, that "hustle" print is by Designs By Maria. Great post!! Megan always has the best paper goods!!! And I'm crazy for her office! Lovely ideas :) I too, would like to know where you got that lovely calendar!! Megan ~ Love it that your son is enjoying crafting too. Yes, and it helps with his writing practice! Great tips Megan! I love wrapping presents but aside from that I'm usually the parent that ends up waiting until the day of the party to get things together. 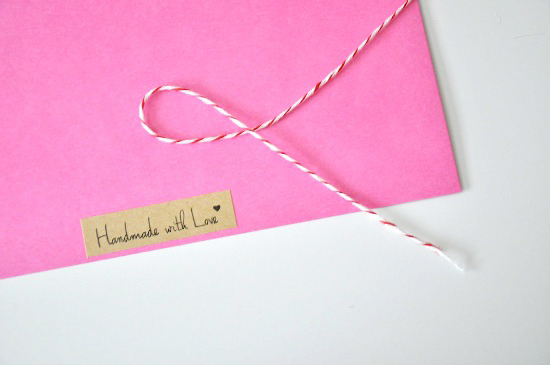 I love the idea of having card making supplies on hand and also gifts at the ready. That happens to me sometimes too, but it stresses me out so I like to prepare in advance. Oh I love this so much! 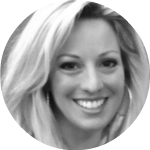 Organization is not my strong point so I make sure to check your blog frequently for all your great ideas and motivation! Great tips! My daughter has a total of 5 parties this month and we are also planning hers! I love evite to keep track of things (with the reminder a couple of days before). I also put everything in my google calendar on my phone so the hubby can see it - including the link to the evite or the details (like remembering socks, etc.). 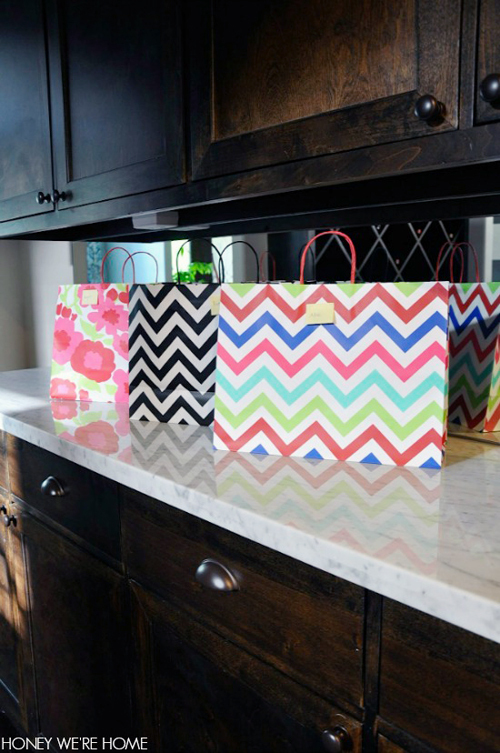 Each weekend before we run errands, I look to the week ahead to see what we need to buy. Right when the gift comes home, we wrap it and the kids make a card for the recipient. Those parties add up! That print is by Designs By Maria. Good idea. I stock up on the free crayons from restaurants! Is your son using a sharpie?! Brave, brave woman! Even with the foam board, my 5 year old would somehow get it all over!! I've heard that before! I do have a red stain on my office carpet from a stamp pad. . . .
Just Awesome..... No words for this simply amazing.